Submitted by mahoney on Fri, 02/29/2008 - 10:58am. 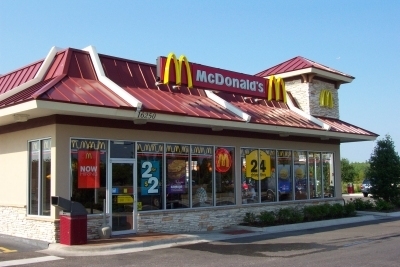 McDonalds Restaurants across the USA including Alaska, Hawaii and Canada...McDonald's restaurants are found in 120 countries and territories around the world and serve nearly 54 million customers each day. The comparison of the file to the McDonalds website locator has now been completed. If any locations were missed, please let me know. The file now shows which locations have PlayPlaces. The latest comparison of the file to the website locator has been completed. The latest comparison of the file to the website locator has been completed. The file now includes in Column D the services available [dt, wifi, pp or none]. In order to obtain this data, it was necessary to look at each location [15,481] in the locator one by one. Submitted the correct coord for 2 locations in York,PA. Completed the update of the Canadian locations. This completes the file update. Complete the update of WV and WY. This completed the update of the USA locations. Completed the update of VA and VT. Added 7 deleted 30 and corrected 9 addresses. Completed the update of UT. Decrease of 2 locatons. Completed the update of TN. Decrease of 3 locations. Completed the update of SD. Updated SC. Added 11, delete 6 and corrected 3 addresses. Updated RI. Decrease of 2 locations. Decrease of 24 locations, not 36. Completed the update of PA. Net decrease of 36 locations. Completed the update of Oregon. Net decrease of 4 locatons. Completed the update of OK. Decrease of 5 locations. Added abbreviations used in file. These are listed on the download page. Completed the update of OH. Net decrease of 18 locations. Updated NY. Decrease of 43 locations. Updated NV. Decrease of 6 locations. Updated NM. Added 7 and deleted 3. Updated ND and NE. Decrease of 4 locations. Completed NC. Added 18 new locations and deleted 6 locations. Updated MS.Added 6 and deleted 10 locations. Also corrected 2addresses. Also no changes to MT. Updated MO. Added 7, deleted 10, corrected 7 addresses and 4 cities. Updated MN. Added 4 and deleted 5 locations. Updated MI. Added 7, deleted 12, corrected 1 address and 2 cities. Updated ME. Added 2 and deleted 2. Corrected 4 addresses. Updated MD. Added 4 new locations, deleted 15 locations and corrected 5 City names. Completed MA. Added 11 new locations,corrected 5 address, deleted 13 including 1 dupe. Submitted a new location. 10565 Bramalea Rd, Brampton,ON L6R 3P4. Completed LA. Decrease of 13 locations. Updated Ky. Added 7 locations, deleted 5 locations and corrected 8 addresses. Updated KS. Added 9 locations and deleted 3 locations. Completed the update of IN. Decrease of 3 locations. Completed the update of IL. Net decrease of 14 locations. Completed the update of ID. Decrease of 1 location. Completed the update of IA. Adde 5 and deleted 3. Completed the update of HI. Completed the update of GA. Increase of 1 location. Completed the update of Florida. Net increase of 12 locations. Completed the update of DC and DE. Noted that this file has been replaced with the Rest Area file. Corrected the CT part of the file. Completed the update of CT. Updated CO. Added 5 locations and deleted 13 locations. Submitted the correct coord for the location at 2439 Steeles Ave East, Brampton,ON L6T 5J9. Updated AR. Also added services (dt and/or wifi) in column D.
Updated AK and AL locations. Also added services (dt and/or wifi) in column D.
Submitted a new location in Lansdowne,PA. Added new locations in Carmel,IN,Indianapolis,IN,Whitestown,IN and Zionsville,IN. Location at 876 Eastgate Dr South,Cincinnati,OH has moved to 812 Eastgate North Dr, Cincinnati,OH. Submitted a new location in Niagara On The Lake,ON. Helped in obtaining the correct coord for the location in Donnacona,QC. Submitted corrected coord for locations in Newcastel,ON and Bowmanville,ON. Corrected the coord for the locations in Phenix City,AL, Columbus,GA and Chesapeake,VA. Submitted an input that helped correct the coordinates for the location in West Lebanon,NH. Added a new location in Spring Branch,TX. Added 2 new locations in Orlando,FL. Corrected the coord for the locations in Kennesaw,GA. Submitted corrected coordinates for the location at 1401 Leesburg Ave, Washington Court House,OH. Deleted a second location in Bayside,NY. Submitted corrected coordinates for the location at 750 Middle Country Rd [WM], Middle Island,NY. Submitted corrected coordinates for the location at 313 Middle Country Rd, Coram,NY. Submitted corrected coordinates for the location at 11600 Blue Grass Pkwy, Jeffersontown,KY. Added new locations in Billings,MT, Fargo,ND, Harrisonburg,VA, Calgary,AB, Leduc,AB and Quesnel,BC. The location at 24482 Lee Hwy, Abingdon,VA 24211 is freestanding, not inside a walmart. Location near Walters,OK has closed. Corrected the coordinates for the locations in Myrtle Beach,SC and Surfside Beach,SC. Submitted corrected coordinates for the location in Frackville,PA and also a new location in Mount Pocono,PA. Submitted corrected coordinates for the location in Springboro,OH. Submitted new locations in Manheim,Pa and Middletown,PA..I deleted 1 location in Middletown,PA. Updated the coordinates for the location at 2340 SR 16, St Augustine,FL. Submitted correct coordinates for the location at 998 Breckenridge Ln, Louisville,KY. Corrected the coordinates for the 4 locations in Uniontown,PA. Submitted a new location at 3000 Russell Pkwy, Warner Robins,GA. Completed the update of all Canadian locations. This completes the update of this file, all 15,642 locations. Completed the update of Va,Vt,Wa,Wi,Wv and Wy. This completes the update of the US portion of the file. Completed the update of TX and UT. Completed the update of RI, SC, SD and TN. Completed the update of PA. Completed the update of OK and OR. Submitted a location in Grand Coteau,LA. Completed update of Ohio locations. Completed update of NV and NY. Submitted a new location in Sherbrooke,QC. Completed the update of NH, NJ and NM. Submitted a new location at 160 Woodman Dr, Dayton,OH 45431. Completed updating NC, ND and NE. Updated MO, MS and MT. Completed the update of MD and ME. Completed the update of LA and MA. Completed the update of KS and KY. Completed the update of HI, IL and IN. Completed the update of FL and GA. Net increase of 34 locations. Completed the update for CO, CT, DC and DE. Completed the updating of California. Net increase of 13 locations. Updated Arkansas and Arizona. Net increase of 25 locations. Updated Alabama with the latest website listing. Added 18 new locations and deleted 1 plus removed 1 dupe. Submitted corrected coordinates for the location at 3250 S Sixth Street, Springfield,IL. Submitted a corrected address and coordinates for the location in Pilot Knob,MO. Added new locations in Lockport,IL and Shorewood,IL. Submitted a new location at 4301 W Wabash Ave, Springfield,IL. Added a new location at 6535 W Happy Valley Rd, Phoenix,AZ 85310. Added a new location at 6601 N Orange Blossom Trail, Mt Dora,FL 32757. Submitted corrected coordinates for the location in Delran,NJ. Submitted corrected coordinates for the location in Ebensburg,PA. Submitted corrected coordinates for the location in Morton,IL. Corrected coordinates for locations in Peru,IL and Houghton,MI. Added new locations in Chisago City,MN, Hinckley,MN and Mora,MN. Submitted corrected coordinates for the location in Salem,IL. Noted that the location in Fernley,NV was incorrect. Location corrected. Submitted corrected coordinates for the location 3417 Orchard Way, Oswego,IL. Submitted that the Mcd at 340 Main Ave, Norwalk,CT has removed the PlayPlace and replaced it with outdoor seating. Added 2 new locations in New York,NY and 1 in Brooklyn,NY. Submitted a new location at 523 N State Route 47, Sugar Grove,IL 60554, (630) 466-8097. Submitted a new location at 273 East Roy Furman Pkwy [Exxon], Waynesburg,PA 15370, (724) 627-0616. Corrected the coordinates for the location at 5190 E Hwy 100, Palm Coast,FL. Location in Flagler Beach,FL does not have a playplace. Submitted corrected coordinates for 7 locations. Submitted corrected coordinates for 4 locations in Lethbridge,AB. Submitted a new location at 180 Endicott St, Danvers,MA. Submitted a change that the location in Islip,NY has removed its PlayPlace. Submitted an address correction for the location in Mayer,Az. Submitted corrected coordinates for the location at 19601 E Cordes Lake Road Mayer,AZ. Added a new location at 2210 CR 540A, Lakeland,FL 33813, (863)644-7900. Added new locations in Kodiak,Ak, Wellington,Co, Torrington,Wy and 2 in Bakersfield,Ca. Added new locations in ON ,New Liskeard (2), Timmins (2), Sturgeon Falls and Kapuskasing and one in Malartic,QC. Submitted a new location at 1209 Branson Hills Pkwy, Branson,MO. Added locatons in Spruce Grove,AB, Stony Plain,AB and Westlock,AB. Submitted corrected coordinates for the location in Pincher,Creek,AB. The location in Louisville,OH is removing its PlayPlace. Submitted corrected coordinates for the location at the Pittsburgh Intl Airport Satellite Terminal, Pittsburgh,PA. Submitted corrected coordinates for the location at 3640 W Tangerine Rd, Marana,AZ, (520) 744-4788. The location at 2330 Fort Henry Drive,Kingsport,TN no longer has a Play Place. Corrected the coordinates for the location in Covington,Va and White Sulphur Springs,Wv. Submitted a new location at 10701 N Knoxville, Peoria,IL 61615. Corrected the coordinates for the location in Franklin,VA. Submitted corrected coordinates for the location at Allendale Shopping Ctr, Pittsfield,MA. Submitted corrected coordinates for the location 3225 S Arlington Rd, Akron,OH. Noted: The location at 4300 W Stone Dr, Kingsport,TN has been remodeled and no longer has a PlayPlace. Submitted corrected coordinates for the location at 9142 Cincinnati Columbus Rd, West Chester,OH. Submitted a location at 1285 Cliveden Ave, Delta,BC V3M 6M3. Noted: The location at 101 Hylton Ln, Beckley,WV has been rebuilt as a mccafe and no longer has a PlayPlace. The location at 5301 Kings Mills Rd, Mason,OH has reopened. The location at 89 Jim Kemmett Blvd, Napanee,ON is in a Walmart. Submitted corrected coordinates for the location in Mt Union,PA and the location in Huntingdon no longer has a PlayPlace. Noted: The location at 220 Ann Arbor Rd W, Plymouth,MI has been remodeled and does not have a playplace. Submitted a location in Iowa Park,TX. Noted that the location at 1374 S Military Hwy, Chesapeake,VA does not have a PlayPlace. The location at 597 Nw Parkway, Azle,TX has reopened. Added new location: 235 Palm Bay Rd W, Melbourne,Fl. Stated that the location at 169 Tillary St, Brooklyn,NY has closed. Submitted corrected coordinates for the location in Harrisonville,MO. Corrected the coord for the location in Fredericktown,Mo. Drive thru Only. Located in old WM building. Corrected the coordinates for the location in Lake Park,Ga. Also included the interstate exit number. Completed comparing MN to the website locator. Completed comparing IA and NE to the website locator. Completed comparing MO to the website locator. Completed comparing Ok to the website locator. Completed comparing UT to the website locator. Completed comparing TX to the website locator. Completed comparing NM and NV to the website locator. Completed comparing Maryland to the website locator. Completed comparing New Jersey to the website locator. Completed comparing New York to the website locator. Western NYS had not been included in the original file. Submitted Indiana file after verification against the McDonalds website locator. Submitted Illinois file after verification against the McDonalds website locator. Submitted South Carolina file after verification against the McDonalds website locator. Submitted Georgia file after verification against the McDonalds website locator. Submitted North Carolina file after verification against the McDonalds website locator. Submitted Virginia file after verification against the McDonalds website locator. Submitted Tennessee file after verification against the McDonalds website locator. Submitted Kentucky file after verification against the McDonalds website locator. Completed comparing the Michigan listing to the official website: Added 125 locations and deleted 67 locations. Completed comparing the Idaho listing with the McDonalds website. Also deleted some duplicates in the USA file. Verified the Alaska locations against the McDonalds website locator. Submitted Ohio file after verification against the McDonalds website locator. Reformatted the file, added City/State to each location in column C and deleted more duplicates. Deleted 2 NY locations due to closings. Made numerous changes throughout the file. Added 1 new location in Mahopac, NY. Deleted 1 Charlotte, NC location and added 1 Charlotte, NC location. Added 3 Stevens Point, WI locations. Added 5724 Ogeechee Rd, Savannah, GA location. Corrected various coordinates in NJ, NC and GA. Corrected coordinates on 1 LA location. Corrected coordinates on 2176 West Street in Southington, CT location. Added 2 RUSTON, LA locations. Deleted 1 NC location due to closing. Deleted 2 non-existent loacations in NJ. Corrected coordinates on Englishtown-NJ entry, deleted one non-existent NJ entry and deleted one duplicate NJ entry. Corrected coordinates and address for Duncan, SC location. Added missing address to Hines, OR location, corrected typo on South Elgin, IL location. Added South Elgin, IL location. Corrected coordinates on location in South Willaimson,KY. Made changes on 1 MA location and deleted 1 non-existent location in MA. Removed all remaining duplicate entries. Corrected Various Pennsylvania Locations and removed duplicates.